Central IT department of the government of Genovia is building a new private cloud which will consolidate workloads currently being run at satellite data centers throughout various ministries. The new private cloud should offer centralized security, quick application deployment capabilities, and easy integration of existing application stacks that are using a variety of firewalls and load balancers from numerous vendors. Security zones shared by multiple applications. 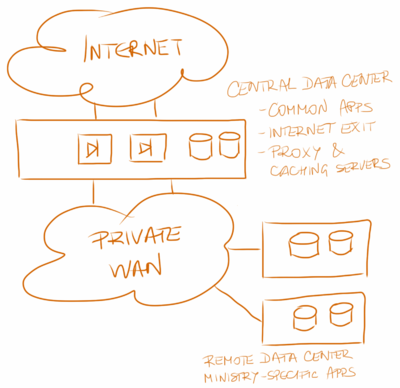 The central IT department provides Internet connectivity to the whole government; other data centers connect to the private WAN network as shown in Figure 2. Applications run within the existing data centers have highly varying security requirements. Most of them need some sort of network-layer protection; some of them require deep packet inspection or application-level firewalls that have been implemented with products from numerous vendors (each ministry or department used to have its own purchasing processes). 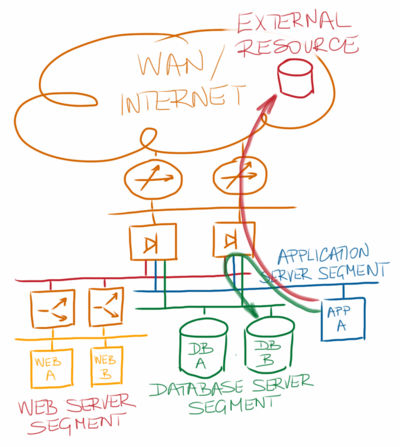 Most application stacks rely on data stored in internal databases or in the central database server (resident in the central data center); some applications need access to third-party data reachable over the Internet or tightly-controlled extranet connected to the private WAN network (see Figure 3). Migrating the high-security applications into the security zones that have already been established within the central data center is obviously out of question – some of these applications are not allowed to coexist in the same security zone with any other workload. The number of security zones in the consolidated data center will thus drastically increase, more so if the cloud architects decide to make each application an independent tenant with its own set of security zones. The consolidated private cloud infrastructure will be implemented with the minimum possible variability of the physical hardware to minimize the hardware maintenance costs, effectively implementing the cloud-as-an-appliance design. 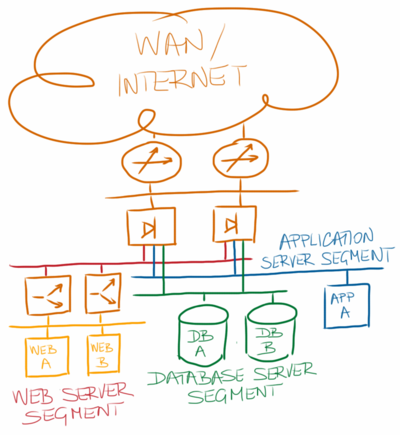 For more details, please read the Designing a Private Cloud Network Infrastructure case study. The cloud architecture team decided to virtualize the whole infrastructure, including large bare-metal servers, which will be implemented as a single VM running on a dedicated physical server, and network services appliances, which will be implemented with open-source or commercial products in VM format.